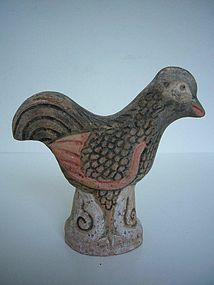 A chinese burial gift, a painted terracotta chicken. Ming Dynasty (1368-1644). H. 12 cm, W. 13 cm. Condition: no damages or repairs, age wear to the original polychrome.